Lose Fat! Reverse the signs of aging! Sign up for Kiana’s eGym & take Online Fitness Classes! I am excited to announce my new Flex HIIT Training Methods to help you stay youthful, energized, reduce fat, increase lean muscle! Reverse the Aging Process with my new Flex HIIT Training Methods: a challenging fusion of strength training, cardio, agility drills and compound moves. How? As we age, we lose appx. 1% of muscle per year. Our bone strength weakens. Our metabolism slows down. We basically get softer, rounder and shorter. Yikes! To fight this, you’ve GOT TO LIFT WEIGHTS AND WORKOUT. Cardio alone will not yield you these results. 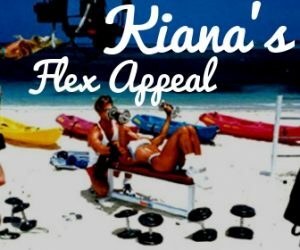 How do Kiana’s Flex HIIT Workouts help slow the aging process? FIX: My Flex HIIT Strength training methods can help preserve and actually increase lean muscle mass. My parents love crossword puzzles. Their doctor told them to do them to keep their brains working. I incorporate agility drills and compound moves which require you to remember various exercise patterns and moves to strengthen your body and brain at the same time. FIX: My Flex HIIT Training Methods focus on key stabilization muscles and exercises that strengthen the postural muscles. FIX: My Flex HIIT Methods provide a fresh, new & challenging routine each and every time. This keeps your muscles guessing so that you get consistent results. An online portal that gives you access to my Gym, ONLINE. You get LIVE weekly workouts. You can browse 500+ fitness videos, classes & exercise tutorials. Log on and take a class or learn a new exercise to keep your workouts fresh. Many group instructors and personal trainers use our service this way. There are moves for all levels. Suitable for all ages.